A World Health Organization (WHO) worker administers a vaccination during the launch of a campaign aimed at beating an outbreak of Ebola in Mbandaka, Democratic Republic of Congo, May 21, 2018. 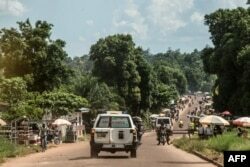 Two dying Ebola patients were spirited out of a Congo hospital by their relatives on motorcycles, then taken to a prayer meeting with 50 other people, potentially exposing them all to the deadly virus, a senior aid worker said Thursday. Democratic Republic of Congo is racing to contain an outbreak of the disease, which spreads through contact with infected bodily fluids including vomit and sweat. The Health Ministry said late Thursday that a new case had been confirmed in the town of Bikoro and another in the nearby village of Iboko, where the epidemic is thought to have started. 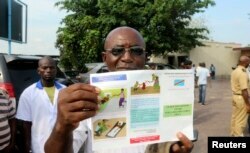 A health care worker displays an Ebola information leaflet for passengers at Ngobila Beach in Kinshasa, Democratic Republic of Congo, May 24, 2018. Congo's fight to rein in a deadly Ebola outbreak has authorities crossing the border to buy up available thermometers. Congo's ninth recorded outbreak of the disease is thought to have killed at least 22 people so far, according to government figures released Wednesday, fewer than the last estimate of 27, after some of those deaths turned out not to be Ebola. "The escape was organized by the families, with six motorcycles as the patients were very ill and couldn't walk," Cabrol told a news briefing in Geneva after returning from the affected region. "They were taken to a prayer room with 50 people to pray. "They were found at two in the morning, one of them dead and one was dying. So that's 50-60 contacts right there. The patients were in the active phase of the disease, vomiting." The patients got out of the isolation ward Monday. Earlier reports did not give details of the escape or where they went afterward. A third patient who left the ward survived. "From the moment that they escaped, the (health) ministry, WHO and partners have been following very closely every contact," he said. An ambulance carries the remains of an Ebola victim to a burial site in Mbandaka on May 22, 2018, in the Democratic Republic of Congo. WHO's three-month budget for the crisis has been doubled to $57 million to carry out a complex operation in a remote, forested area, Salama said. "All it takes is one sick person to travel down the Congo River and we can have outbreaks seeded in many different locations ... that can happen at any moment. It's very hard to predict," he said, referring to the river linking the trading hub of Mbandaka to the capital Kinshasa, whose population is 10 million. "It is going to be at least weeks and more likely months before we get this outbreak fully under control," Salama said. But local skepticism about the dangers and the need to isolate infected patients continue to complicate efforts to contain it. In past outbreaks, mourning relatives have caught the hemorrhagic disease by touching the highly contagious bodies of dead loved ones, sometimes by laying hands on them to say goodbye.